Security window films are known for their powerful, reliable protection. For years, institutions, businesses, and military groups have been using security window film to protect buildings from danger and make them more secure, reducing the risk of property crime, injury, and theft. But did you know that security window film can also make Kansas City schools safer too? Security window films are affordable, easy to install, and offer schools reliable protection in the face of dangerous or violent situations. Security window films are an excellent choice for schools. Unlike metal bars or locks, security window films don’t alter the appearance of windows, which is important for maintaining a pleasant, non-threatening look for a school. Additionally, security window films are much more affordable than bulletproof glass, which makes them a more practical option, especially since most schools have a limited budget to work with. 1. Security window film protects against accidental damage. Intruders aren’t the only risk that schools have to face. Broken glass on its own can be seriously dangerous, and there are a number of things that can cause it to break, from a football tossed the wrong way to someone slipping and falling on tile or down the stairs. Security film mitigates the risk of injury and danger in these situations. 2. Vandalism problems become less complicated. Window films are also great for solving vandalism issues. Installing a window film for your school bathrooms or exterior can help keep your school graffiti free. 3. Security films protect against blasts. Bomb blasts and terrorist attacks are all serious risks for schools. But so are science class experiments gone wrong. Window film reduces the risk of injury and damage in the event of a blast. 4. 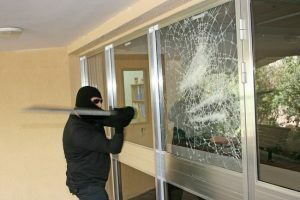 Security window films deter intruders. When an intruder is on campus, you need a plan. Security window film can make it harder for intruders to get into locked classroom doors or school entrances. 5. Window film saves money on energy costs. In addition to improving campus safety, window film can also make school buildings more energy efficient. During one year, schools can save thirty percent on energy costs. Start planning your school renovations today. Call Green Light Window Films to receive an estimate on security window film for your Kansas City school.